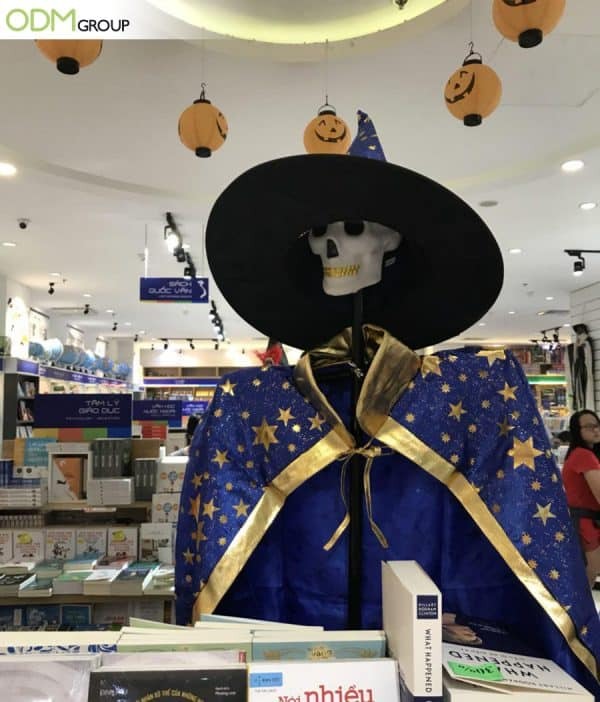 Last week, while the HCMC team was out and about, we chanced upon an extremely cool Halloween promotion that instantly caught the eye. 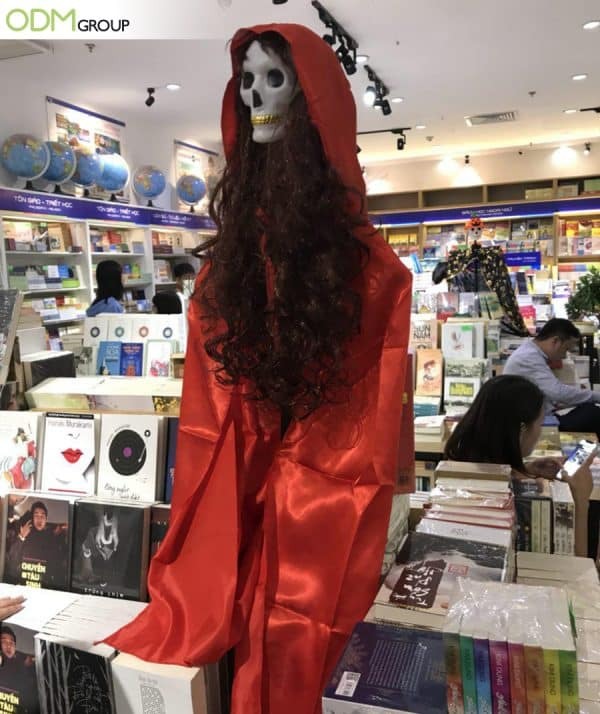 To celebrate the upcoming Halloween festival, Phuong Nam Bookstore created several Halloween-related free-standing displays. These displays had mannequins in Halloween masks wearing Halloween-related costumes. The display attracted us instantly! It attracted us so much that it persuaded us to enter the bookstore to have a look at some books. We even ended up buying a book each! Why does this Halloween Promotion impress us? Prominence: Phuong Nam’s Halloween promotion is easily seen from afar, making it extremely prominent. Even before we reached the bookstore, we were already able to make out that there was a Halloween-related custom in-store display in the bookstore, which pulled us in. Relevance: We like this promotion, as it is relevant to Vietnam. This is particularly so for the bigger cities such as Ho Chi Minh and Hanoi. Since Halloween was introduced in Vietnam in the past decade, it has become extremely popular among the people, and having this Halloween promotion will certainly help to catch the attention of any potential customers! Vibrancy: As we can see, the Halloween Promotions help give the bookstore a more fun and exciting look. With a more vibrant look, customers will be attracted to the bookstore, thus leading to an increase in customers. The display served as their first point of contact. There are many benefits to having a prominent store display, and they certainly help to increase visibility and sales! They also help improve your reputation! Furthermore, with these cheap promotional items, you won’t need to break the bank! So, will Halloween promotions help take your company to the next level? Will it help you achieve your sales goals? Could it help boost your brand? If so, The ODM Group is certainly ready to help! Feel free to contact us! Here are some related blogs for you to read! Here’s a cool temporary tattoo face mask to celebrate Halloween! Halloween promos at a HK trade show, certainly shows how popular it is! Halloween VR Glasses! Mixing new technology with an old favorite!